Mauritius is a volcanic island of lagoons and palm-fringed beaches in the Indian Ocean, has a reputation for stability and racial harmony among its mixed population of Asians, Europeans and Africans. The island has maintained one of the developing world's most successful democracies and has enjoyed years of constitutional order and has preserved its image as one of Africa's few social and economic success stories. Mauritius has traditionally had a primarily agricultural economic system, dominated by the mono-crop sugarcane up until the 1970s. Since then the country has experienced the growth of other sectors, alongside a diversification in the agriculture industry. However, sugar cane retains its position as the most significant agricultural export, whilst also covering almost 90% of the cultivated land area. In 2010 exports of raw sugar generated $218,550,000 and refined sugar generated $33,090,000. Overall the move away from agriculture has seen a decline in its contribution to the national economy, with agriculture, forestry and fisheries contributing 4% to the GDP in 2010. However, agricultural land accounted for 48.3% of total land area in 2009. The Mauritian manufacturing sector has traditionally been dominated by textiles and sugar production. In 2010 the industrial sector in Mauritius was responsible for producing 452, 473 tonnes of sugar. More recent diversification into jewelry production, optical goods manufacture, furniture making, light engineering and electronic components manufacture and assembly has expanded the sector. The main agricultural products, aside from sugarcane, include tea, corn, potatoes, bananas, pulses, cattle, goats and fish. The country has seen an increase in the production of flowers and fruits. Flowers grown on the island are exported towards Europe, Asia, Australia and the United States. Exports of mangoes, pineapples, lichis and bananas are sent to the European Union. High freight costs have also pushed entrepreneurs towards increasing the proportion of processed fruits and vegetables for export. The Ministry of Agro Industry, Food Production and Security oversees the promotion of agricultural production, with a specific focus on products that include milk and meat, horticultural products, sugar and tea. The government stipulates that ensuring the sustainability of the agricultural sector as a primary pillar in the country's economic development remains a key focus. 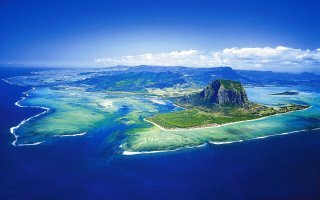 Agriculture, forestry and fisheries contribute 5% to Mauritius's GDP - with a shelf area of 3046 km2, a coastline of 276 km, and an Exclusive Economic Zone of 1.9 million km2 the island nation of Mauritius and its outer islands have rich fishing grounds. There are estimated to be 5100 people involved in the primary sector and 6800 in the secondary sector. Mauritius is a key exporter of goods to the United States and parts of Europe; the main products for export include: clothing and textiles 20%; fish products 11%; and raw sugar cane 11%. Major products imported into the country include refined petroleum oils which comprise 19% of the country's total yearly imports, a vast majority of Mauritius' imported goods come from India, China and France. The country's main trade partners are the European Union, India and the United States. Thus, Mauritius's exports include textiles, sugar and fish, and its main export partners are the United Kingdom, France, the United States, Madagascar and Italy. Mauritius exports clothing, textiles, sugar, cut flowers, molasses and fish towards the European Union (United Kingdom, France, Italy, etc. ), the United States, South Africa, Madagascar and Vietnam. Sugar cane occupies 90% of the country's cultivated land and represents 15% of its exports. The export of services has been constantly rising. In this area, the country has a positive trade balance. Mauritius is a volcanic island nation in the Indian Ocean and it is known for its beautiful beaches, quiet lagoons and picturesque reefs. Being of volcanic origin, these islands separated by sea pits of 4,000 metres deep, have emerged from the abysses as a result of gigantic underwater volcanic eruptions that happened thousands of kilometres to the east of the continental block made up by Africa and Madagascar. Mauritius imports more than it exports, resulting in a trade deficit that increased during the economic crisis and should continue increasing in the coming years. However, according to available records, this deficit was reduced between 2012 and 2013 due to a slight increase in exports. Mauritius' main imports are: oil, manufactured goods, capital equipment, capital goods, foodstuffs, chemical products. Mauritius' main import partners are: India, China, European Union, Australia, South Africa and France. Mauritius is a net importer of goods and services at 4% of GDP. The average ad valorem tariff for imported goods is 3.5%. Mauritius is a member of the COMESA Free Trade Area and resultantly 0% customs duty on eligible goods originating in the country is required in the free trade area. Petroleum fuels are required for the marine, automotive and aviation sectors, but Mauritius has no known oil, coal or gas reserves so petroleum products are Mauritius' major imports, with about 1 million tons brought in each year. Mauritius usually procures petroleum products through open international tenders. Republic of Mauritius is an island nation in the Indian Ocean. The economy is based on tourism, textiles, sugar, and financial services. In recent years, information and communication technology, seafood, hospitality and property development, healthcare, renewable energy, and education and training have emerged as important sectors, attracting substantial investment from both local and foreign investors. Mauritius has a three column tariff based on the Harmonised System. Most duties are ad valorem, assessed on the Cost, Insurance and Freight (CIF) value and specific rates are assessed according to the specified unit of measure. Customs duty is applicable on imported goods and the rates vary from zero to 15 per cent on the CIF value. Under the Customs Tariff Act, the Customs Department administers numerous schemes of exemption and concession of duty to various sectors of agriculture, industry and travellers. Drawback is allowed on goods that have been imported for the purpose of undergoing processing and thereafter exported. Provisions are also made for the temporary admission of goods. An excise duty at importation and on local manufacture (exports are exempt) is applicable on selected items: alcoholic beverages, motor vehicles, petroleum products, tobacco products. Preferential rates apply to imports from certain countries e.g. Southern African Development Community (SADC) and Common Market for Eastern and Southern Africa (COMESA) member states. To be eligible for the preference rate, goods must be accompanied by a certificate of origin. Set-up in 1992, the Mauritius Freeport is a duty-free logistics, distribution and marketing hub for the region. Logistics and warehousing facilities are available for the transhipment, consolidation, storage and minor processing of goods. This provides a good platform for organising trade within the region, e.g. importing for redistribution to the extended markets represented by the COMESA and SADC after some additional processing. The Commerce Division of the Ministry of Industry, Commerce & Consumer Protection is responsible for the control of importation of these items in collaboration with other controlling agencies. For certain strategic reasons, trade in some products is overseen by parastatal organisations. The State Trading Corporation (STC), the Agricultural Marketing Board (AMB), and the Mauritius Meat Authority (MMA) are among the main parastatal organisations involved in the monitoring of certain products. The STC is the only authorised importer of essential commodities like basic rice, wheat flour in bulk and all petroleum products. The importation of luxury rice is entrusted to the private sector and local oil companies distribute petroleum products. The AMB monitors importation of agricultural products which compete with domestically produced goods for which there are marketing schemes and guaranteed prices, such as: potatoes, onions, garlic, maize,turmeric, cardamom.